A dog bite is a form of personal injury that is mostly preventable. These injuries can sometimes be minor, but they can also lead to severe bleeding, nerve problems, and infection. Every situation is different in dog bite cases because multiple factors can lead to a dog bite injury. A majority of states place fault on the dog’s owner if the dog causes an injury, whether the owner knew the dog was being dangerous or not. Strict liability statutes impose liability without fault, meaning the injured individual does not have to prove that the dog’s owner did anything wrong. Most other personal injury cases require the victim to show that someone was being negligent and that negligence is what caused their injury. For dog-bite cases, the laws require the owner to be responsible for any damages that the animal causes, without exception. Even if the dog’s owner was being careful or didn’t think the dog would hurt anyone, states with strict liability will still hold the dog owners responsible. Louisiana has a unique dog-bite statute. The LA statute states that the owner is liable for damage caused by the animal if they knew or, should have known that the animal’s behavior could lead to damage. Other states give all liability to the owner, no matter if the act was preventable or caused by a negligent act on their part. 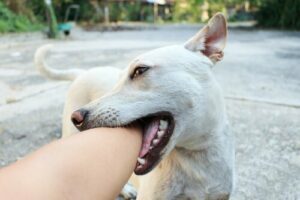 The Supreme Court of Louisiana held that a dog bite victim is required to prove that the dog posed an unreasonable risk of harm, in addition to the facts that must be proved in the more common dog bite statutes. Other states do not require the victim to prove anything as long as they are injured. If you or someone you know has been injured by someone else’s dog, it is important to get the proper information in case you want to press charges. Sometimes a little scratch from a dog can seem like nothing, but it can develop into an infection later. Even if you do not think you will press charges, it is a good idea to get the owner’s information either from the owner or from the dog’s collar. If you or someone you know has been injured from a dog bite, contact Babcock Trial Lawyers to be your personal injury lawyers today!